Plot Jerry (Ryan Reynolds) is that chipper guy clocking the nine-to-five at a bathtub factory, with the offbeat charm of anyone who could use a few friends. With the help of his court-appointed psychiatrist, he pursues his office crush (Gemma Arterton). However, the relationship takes a sudden, murderous turn after she stands him up for a date. Guided by his evil talking cat and benevolent talking dog, Jerry must decide whether to keep striving for normalcy, or indulge in a much more sinister path. I've actually never heard of this Ryan Reynolds movie. 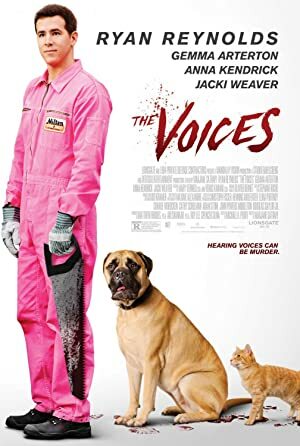 I've seen the other "Voices" movie from 2014, but not his one. I guess I know what I'll be watching this weekend! If you've seen it, please let me know what you think. I only created the thread after I found this obscure movie. Maybe somebody else has seen it? I think we've got a copy at work. If so, I'll check it out sometime and report back.